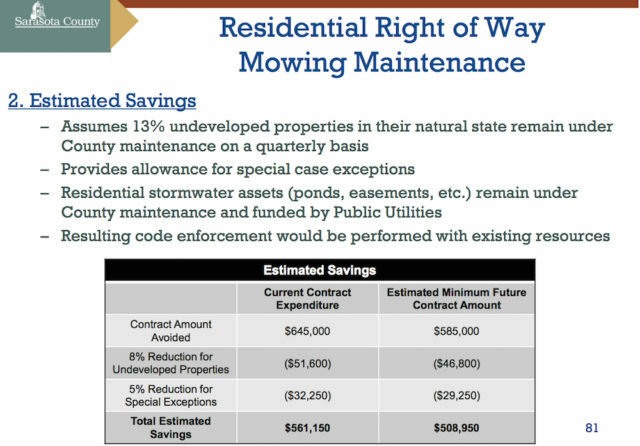 It took only about nine-and-a-half minutes for the Sarasota County Commission this week to approve staff recommendations that are estimated to save about $560,000 in residential right of way mowing expenses. The board voted 4-1 during its April 27 mid-year budget discussion to authorize a public hearing in August, so new county mowing contracts can be negotiated before the start of the next fiscal year, on Oct. 1. Commissioner Christine Robinson cast the “No” vote. In an interview with The Sarasota News Leader after the meeting, Robinson said, “I’m not confident that our county is ready for this change. I’m concerned about the aesthetics of our county.” She pointed to the problems that arose in 2012 and 2013, after firms walked away from county mowing contracts, leading to widespread complaints about the look of medians and rights of way. If changes are to occur in the mowing program, she added, she believes they need to be more gradual. 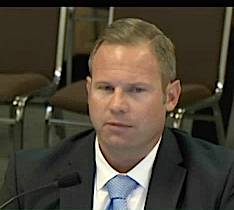 Spencer Anderson, a senior manager in the county’s Public Works Department, explained during his April 27 presentation that — in response to comments commissioners made during a March 30 discussion of the matter — staff has put together a community outreach plan to prepare the public for the changes. 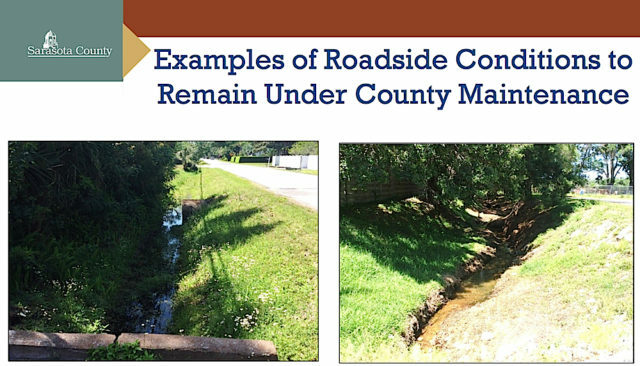 Next month, he said, an information page will be added to the county’s website, and in June and July, staff will hold public information meetings — in both North and South county — to explain the new level of maintenance. Those latter sessions would not necessarily be workshops, he added, but they would serve as opportunities for members of the public to offer their views of the proposal. The advertisement for the public hearing would be posted in July, he continued, and the public hearing would be held in August. Finally, in September, after the public hearing — presuming the board approved the changes — staff would send notices to the news media. Other possible means of notifying the public, he continued, would be to send out mailers. However, Anderson explained, given that “roughly 28,000 individual parcels” would be affected, he was not certain a mailer would be cost-effective. Therefore, he noted, putting the information on utility bills the county sends to customers or on the annual TRIM notices that contain ad valorem tax details would be potential means of communication. 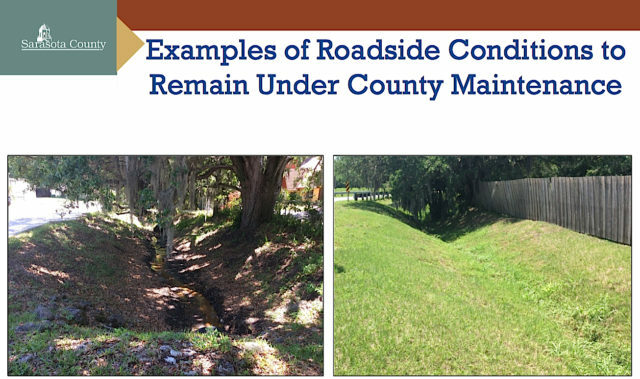 County staff also would continue to maintain areas with large drainage pipes — structures in excess of 30 inches — he said, along with property near crosswalks and bus stops, where public safety concerns would be a factor. 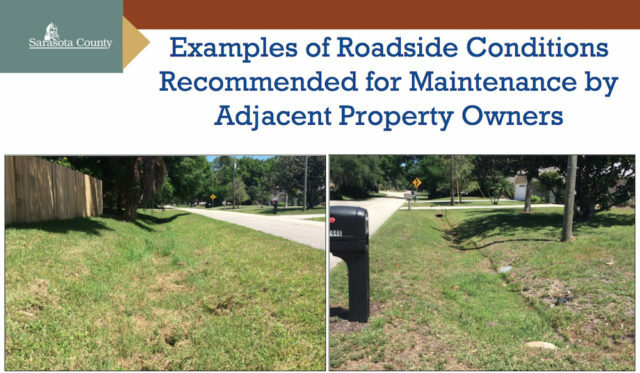 Additionally, staff members would keep mowing the county’s residential stormwater assets, such as ponds and easements, Anderson explained, and they would maintain undeveloped properties in a natural state. The latter areas would be mowed quarterly instead of eight times a year, Anderson noted. Moreover, staff does not anticipate any additional Code Enforcement efforts will be needed, Anderson told the commissioners. “We have inspectors doing 100 percent inspection on mowing services,” he said. “They would no longer be doing that for residential areas” after the reduction in county mowing, he pointed out. Commissioner Charles Hines made the motion to approve the staff recommendations, including authorization of the public hearing on the proposed changes. Commissioner Carolyn Mason seconded the motion. The county has been drawing down its “rainy day” reserve over the past several years to fill in budget gaps resulting from a 42-percent reduction in ad valorem tax revenue at the height of the Great Recession. Then, with Robinson in the minority, the motion passed 4-1.